Shirts With Random Triangles: Eric Hyman Announces He Is "Stepping Down" From Position As Texas A&M AD. Eric Hyman Announces He Is "Stepping Down" From Position As Texas A&M AD. Eric Hyman. Image via The Houston Chronicle. The panic level in College Station is about to his "Cats and dogs living together" levels. 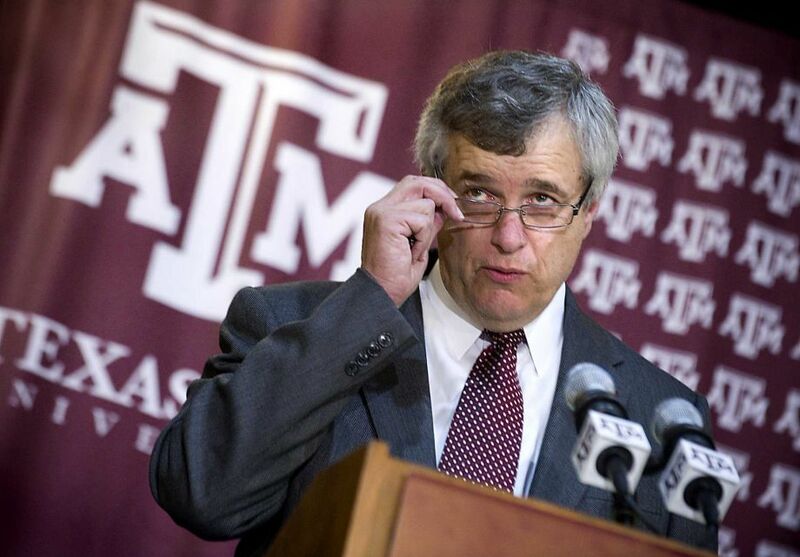 Texas A&M athletic director Eric Hyman announced on Tuesday afternoon that he is stepping down from his position. In a statement, Hyman said that "I appreciate my time here at Texas A&M University and I am proud of our student-athletes' achievements both on the field and in the classroom. The best part of an AD's job is forming wonderful relationships with student-athletes, colleagues, former students and Texas A&M has been no exception. I will always value my time here and the friendships I have made with Aggies. I wish Texas A&M University nothing but continued success." Hyman came to Texas A&M in 2012, after serving as AD for South Carolina for seven years. During his tenure, he oversaw Texas A&M's first season as a member of the SEC, which exploded into history with the Heisman Trophy-winning performance of then-Aggies starting quarterback Johnny Manziel. The Aggies's early success in the SEC boosted fundraising efforts for the renovation of the 88-plus year old Kyle Field. The announcement of Hyman's departure is the latest in a series of events that have left the Texas A&M football program in a state of chaos since the end of the 2015 regular season. Kyle Allen and Kyler Murray both announced their plans to transfer to other schools in December. The Aggies went 8-5, including a 27-21 loss to Louisville in the 2015 Music City Bowl.